Bangkok, 11 April, 2016 – Thailand is elevating the profile of the annual Songkran Festival to ensure local and international travellers enjoy a more ‘authentic experience’ and get the chance to ‘discover more amazing stories of Thainess while joining the celebrations for Thai New Year in the kingdom. 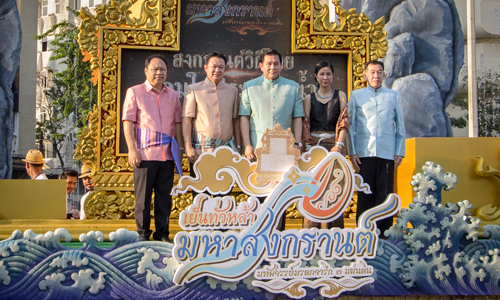 This year’s festivities began with the “Songkran Splendours: The Procession of Three Kingdoms” grand opening ceremony, which took place yesterday (10 April, 2016). Songkran or the Thai New Year has been celebrated in the kingdom for hundreds of years. Traditionally this was the time when agricultural work could come to a halt for a few days, so that the Thai people could pay respect to their ancestors and senior members of the family by sprinkling their hands with scented water. It is also a time to enter the temples and bathe the sacred Buddha images. As Songkran is a time when families come together and the country is unified for several days of fun and togetherness, the Royal Thai Government wants to ensure these traditions are preserved. One way of doing this is by promoting the festival internationally, so that other countries can enjoy this unique time of year and come to join the celebrations. Mr. Yuthasak Supasorn, Tourism Authority of Thailand (TAT) Governor said, “Songkran is the most important festival in the Thai calendar and is celebrated in different ways up and down the country. 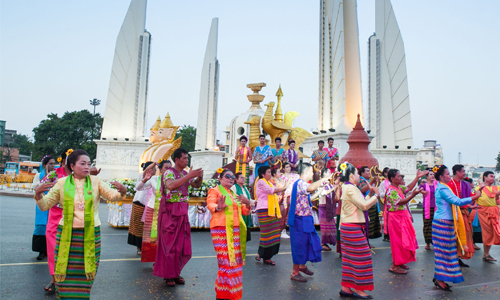 We want travellers to discover more about this unique Thai event and to get a taste of the huge range of distinct local festivals. So we are getting Songkran off to a great start with our Grand Songkran Celebrations that will help people learn about Songkran’s long history and special traditions. “The grand Songkran procession in Bangkok is aimed at setting the tone for the 2016 Thai New Year celebrations nationwide, including special festivities in 8 key locations supported by TAT. Furthermore, TAT is following the government’s water-saving policy which encourages people to use water more conservatively when celebrating Songkran,” Mr Yuthasak added. The main stage for the 2016 grand Songkran celebrations was at the Maha Jesadabordin Royal Pavilion in Bangkok’s old quarter or Rattanakosin Island. This was the setting for the grand opening ceremony on Sunday, 10 April. Throughout the Songkran period, other activities have been scheduled to be held in areas around the historic parts of the Thai capital, including around the Bangkok Metropolitan Office, the Banglamphu community, Khao San Road, Suan Santi Chaiprakan, Wisutkasat, Nagaraphirom Park, and other surrounding temples. For more images of Songkran Splendours: The Procession of Three Kingdoms, please click here.